Posted on April 10, 2015 at 3:44 pm. Easter may be over, but the magic the festive holiday brings seems to be sticking around with Microgaming’s new slot Rabbit in the Hat being released this week. 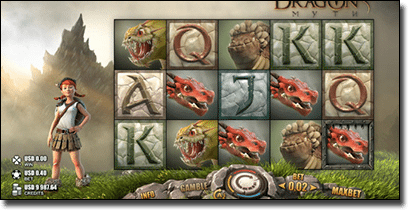 Additionally, players will be treated to another new slot, with Microgaming bringing out Dragon’s Myth on the same day. Rabbit in the Hat shows no signs of paying homage to Easter but still features a rabbit – so we might hold onto that fact in order to void any feelings of guilt when eating our easter egg haul while spinning the slots. With 5-reels, but only nine paylines, Rabbit in the Hat has an interesting format, similar to the slots such as 5-reel Drive, Jewels of the Orient, and Tiger Moon, which players can find at Royal Vegas under the 5-reels, nine paylines category in order to experience the format before the release of Rabbit in the Hat. With 90,000 coins up for grabs for the jackpot, this one is worth a spin if you like the format as it is quite high for the number of paylines available. For example, the aforementioned slots only offer up to 12,500 coins at the most out of the three due to the lack of paylines involved, so it is quite interesting to see so many coins available for the jackpot. The theme of the slot is quite fitting in association to the name as it involves a magician situated on a stage and symbols which only a magic man would have. The intriguing feature to this slot is represented by the magic hat, which appears randomly above reel 5 and will move every spin to the left of every reel. When a wild symbol appears below a reel which has the hat on it, players can win an abundance of prizes. This slot has some worthwhile features and the Head of Casino Games at Microgaming, Mike Hebden, said in a press release earlier this year that Rabbit in the Hat is an exciting new title for the top leading software developers. 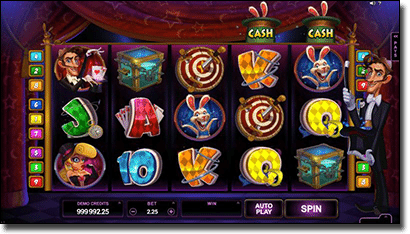 “Rabbit in the Hat is a fast-paced game with a host of appealing features, including a new style free spins feature,” he said. The free spin feature Hebden is talking about involves players scoring 10 free spins which can then transformed into 50 free spins with the magic hat causing free spins being re-triggered. This on top of the jackpot has us very excited. Dragon Myth on the other hand has the same 5-reels, but a 20 payline format. It has been developed by a partnership between Microgaming, and the software developer Rabcat a company which was established in 2001, in Vienna and have slowly made a name for themselves. CEO of Microgaming, Roger Raatgever, has explained the partnership in a press release back in 2014, stating it is mutually beneficial. “This is an exciting deal, particularly for our download casino operators who will now have access to Rabcat’s cutting-edge 3D slots for the first time,” he said. Dragon’s Myth features the win both ways option as well as some amazing 3D graphics Rabcat has made its name with. This slot has 100,000 coins to win, so just a little more than Rabbit in the Hat if this is what you want to base your decision on when picking between the two (but we recommend trying both). The game follows the story of a female dragon capturer attempting to catch four dragons which are all across the reels. Additionally, players can get 10 to 20 free spins, when they land three to five scatters respectively. In the free spins feature the symbol that represents free spins turns into a bonus symbol meaning players can win even more prizes. These titles will only be available on desktop and browser platforms at the moment, but we’re sure it won’t be long until players can access these via their mobile devices. Both Rabbit in the Hat and the Dragon Myth slot offer great potential for wins and free spins, and are available at our recommended online Microgaming casinos players.